Before trying to find a cure for your adhesion failure, it is wise to really be sure how the joint has failed. So you need a failure mode - not just "adhesive" or "cohesive" (though these are a good start). Although we think it should be easy to spot adhesive failure, in practice it is hard to know if there is a specific interface failure (such as hydrolysis of a primer) or a subtle near-interface failure where, for example, polymers have phase separated. It is even harder in cases where the Crack Depth calculations show that the crack can jump to very slightly below the interface. The There is another version of the Near-interface mode due to over-crosslinking failure where the local polymer is too tightly attached to the adherend (e.g. aluminium) to be able to remain integrated into the overall polymer network. 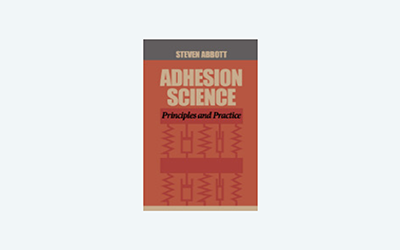 The dissipative contribution to adhesion is often much larger than is suspected so it is vital to check for its presence (if things are going well) or absence (things going badly). A rather simple test (though the introduction of stresses via differential thermal expansion can complicate matters) is to dunk the bond into liquid nitrogen to see if it gives easy adhesive failure (so the original bond is likely to be largely dissipative) or still gives reasonable adhesion which means there is significant entanglement. The structural failure type should be obvious - if the literature is full of FEA studies then this is the sort of bonding situation (and test) where the structural mechanics and focussing of stresses at small areas of the interface are of greater significance than a bit of extra surface energy, dissipation or entanglement. The coherence type is, for example, failure of a vacuum-coated interface where the flaw is that the coating (e.g. aluminium) is so bad that it can form no coherent film able to resist adhesion. A typical thought process goes like this: There should be enough chemical bonds from the aluminium to the polymer to create an "entangled" network that is linked through the aluminium. But if the aluminium is itself not linked then this network cannot exist and adhesion is poor.